On first thought, Cincinnati may not seem like a hiker’s town. But read on and you just may change your mind. Cincinnati is a son of a river, born on the banks of the mighty Ohio, between the points where the Little Miami River and Great Miami River release their waters to the Ohio River. These rivers cut great valleys, giving Cincinnati topographical relief, vertical variation, if you will, that enhances a landscape where the flora and fauna of the East, the Midwest and the South meld into a mosaic of nature. After starting with an attractive landscape you add quality parks that preserve not only the plants and animals — the natural history — but also human history. Over time, area residents began to appreciate and acknowledge this scenic beauty in the Seven Hills of Cincinnati and points beyond. They could see that the special places would remain special if they were held by the public for the public to use and enjoy, to create parks and preserves. Luckily for us, the city of Cincinnati and Hamilton County began a tradition of creating parks, from Mount Airy Forest nearly a century back to newer parks such as Fernbank Park. Trails became part of these natural oases. Additionally, the state of Ohio has established several state parks within easy striking distance of greater Cincy, such as East Fork State Park. The establishment of some preserves extends back to the Great Depression of the 1930s, when the Civilian Conservation Corps came in and built campgrounds, picnic shelters and other facilities to enhance the already verdant beauty in what became the state parks. Of course, they built hiking trails to explore hills and valleys, vistas and waterfalls. The same story was going on in city, state and county parks in Kentucky to the south and Indiana to the west. Today, we hikers benefit from a cornucopia of parkland throughout the Tri-State. It all adds up to an impressive array of hiking destinations! 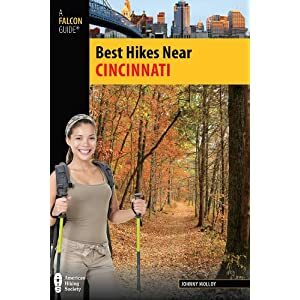 It is in Cincinnati and this greater region where the hikes in this book are found. After having the privilege of researching potential hikes for this book, hiking the hikes, taking photographs, finding the ones that made the grade – and the ones that didn’t, exploring the parks beyond the trails, mapping the hikes then actually writing and completing this book I couldn’t help but reflect on the wealth of places found within the scope of this book. Shawnee Lookout came to mind first. It is one of the most famous area landmarks. And it is a microcosm of the Tri-State. Shawnee Lookout offers a remarkable hilltop view of not only the Great Miami River, but its mother river — the mighty Ohio, the mother of Cincinnati. Also visible were the green hills of Kentucky and Indiana beyond. Shawnee Lookout harbored not only the natural beauty of the Tri-State but also the human history found here, starting with the Shawnee Indians and the amazing earthworks found at this park.